I do like an Ork. I’m also known to be rather fond of an Orc. I’d probably be quite well-disposed to an Orruk as well if it wasn’t for the fact that saying it aloud makes it sound like I have the hiccups. This week sees a major new release for the Orruks of Age of Sigmar but if you’re a Warhammer player who knows that ‘da old ways are da best’ or you’re hell-bent on ransacking the 41st Millennium there’s sure to be something for you here as well. After all, whenever something new has been released for the Orcs in the past I’ve poured over it trying to work out if I could strap a sluga to it and induct it into my Waaargh! and this time will be no different. I’ll add that this is not really intended as a review of the release, I’ll leave that to more talented bloggers than I, but more a collection of my thoughts and ideas generated by a first look at the new models. The meat of this release is the Brutes. For the Ork fan in your life (that would be me) these guys look like a treasure trove of bits for converting even more mean-looking Nobs. For the Orc-lover these could be the Big ‘uns you’ve been waiting for, assuming you can see past the whole End-Times/Age-of-Sigmar/Destroying-Everything-You-Once-Held-Dear affair. Long ago, when I first started my collection of Orks, I set myself the challenge of making every last boy unique. After all, I reasoned, Orks are a fairly (small c) chaotic mob and I like converting things. For the boys themselves there are a lot of options available but for the Nobs the number of possibilities is a bit thinner so these are very welcome to bulk out the selection. The combination of weapon and armour for this one in particular excites me – picture him if you will with a few rusty mechanical ‘upgrades’ and you’ve got a cybork of no mean proportions. In spite of a good range of shouty, angry faces though there’s not a lot here that’s wildly unusual or unique, which is a shame. There are also no helmets to tie them in with their new buddies the Black Orcs. Confusingly these are now known as ‘Ardboys – perhaps because people like me were already using them to convert their own 40k ‘Ardboys. The other major downside of these guys is the lack of a particularly silly name which I can mock shamelessly in my search for a cheap laugh. Luckily this is covered extensively by the rest of the release so disaster is averted. The headline release here of course is the Megaboss on a Maw-krusha. The trend for GW-unique names seems to have hit a bit of a stumbling block here. Instead of calling this something sensible like a Wyvern they used the name Maw-krusha which puts me in mind of Mantic’s Mawbeasts; perhaps not what the bigwigs in the Citadel had in mind. Much as I love the Helldrake it’s an uphill battle to make it as a dragon in 40k, rendering this an almost exclusively fantasy beast. 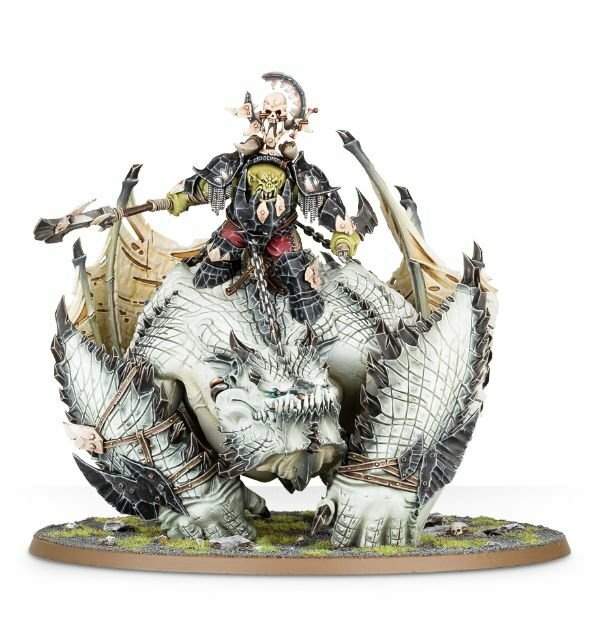 For everyone waiting for a Warboss on a Wyvern for their Warhammer army this is it (albeit one that’s been at the pies rather more than is traditional for this normally sleek creature), and well worth the wait in my opinion. The only downside is that you’ll have to pick up a rectangular base for it but I’m sure you can cope. Were I a rich man this is the one I’d be rushing out to buy. As it is, I’m not so I won’t. Although the Megaboss himself is very much posed as a rider, and therefore liable to look somewhat silly without his mount, he still offers a number of useful components for anyone looking to convert their own Warboss (something we’ll get onto in a moment). This face for instance strikes me as being particularly useful, and packed full of Orky character. 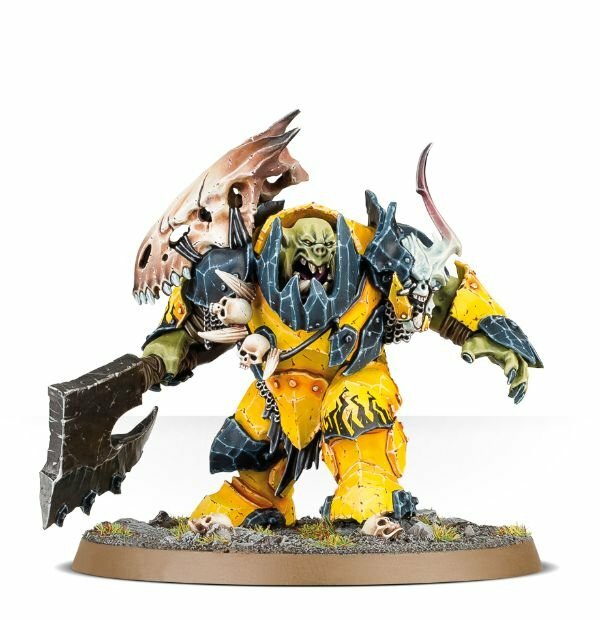 The other variant of this kit is Gordrakk, the Fist of Gork, whose Maw-krusha appears to be in the process of consuming a pair of curtains, for reasons I’ve yet to fathom. Chaos convertors who want to add Tamurkhan the Maggot Lord to their collection but are looking for something different to the Forgeworld model could also consider sprucing this chap up with spares from the Maggoth Lords kits. When you’ve built it be a good chap and post a link in the comments box so I can see it too eh? This is where I found myself getting a little disappointed. The Ork/cs need a new boss and as it stands the options are thin on the ground. Everyone with the slightest touch of green in their soul picked up the Assault on Black Reach starter set a few years ago which means that the Warboss from said kit became as common as brown rats, town pigeons and moaning people on the Internet. Look – even I painted one! I’m not denying it’s a cracking model but some variety would be lovely to see. Unfortunately our options are, in the main, the Orc Warboss from Warhammer (a little bit too small), Ghazghkull Thraka (too iconic), Grukk Face-rippa (essentially an official conversion of the AoBR model) or the old finecast Warboss (nice enough but not that easy to convert). Personally I was hoping that this guy would be the one we’ve been waiting for but sadly his lumpen, over-armoured form leaves a lot to be desired. I don’t hate him, far from it, but I’m not awed either – and I rather hoped I would be. Never mind, let’s see what else we’ve got. This is very much the shaman of old, albeit now with a much sillier name. 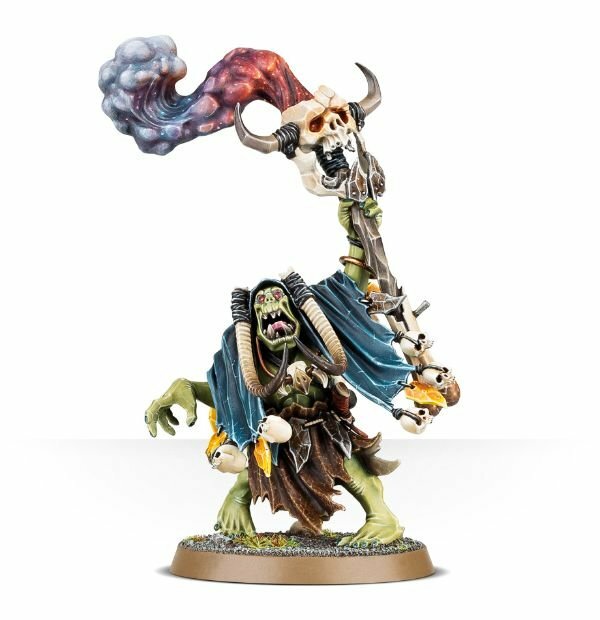 On the one hand its a beautiful model – one of the real highlights of the release – and would serve nicely as an Ork Weirdboy with a few judicious tweaks. 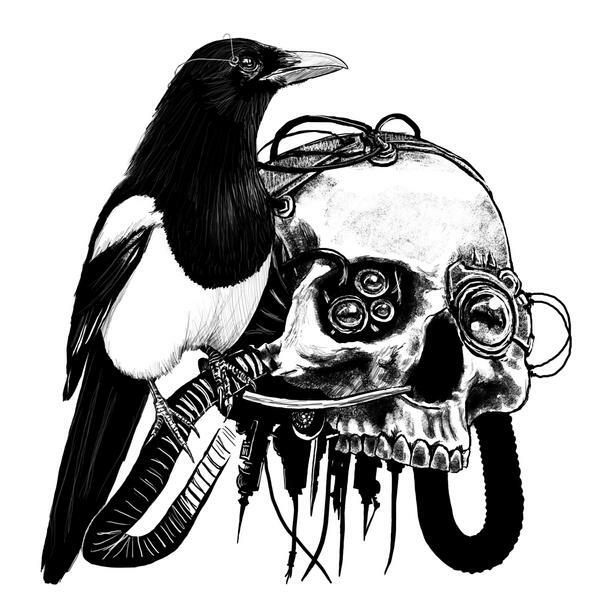 Further conversion could create all kinds of chaos mutants, mechanicus or Haemonculi coven thrall-beasts or the feral-world brutes that hang around with the more interesting sort of Inquisitor. My only real gripe is the sculpted smoke effect but to be fair I almost never like sculpted smoke or flame so that’s really more a matter of personal taste. However the greenskins have hardly been crying out for a new shaman so it’s not really plugging a gap in range. Still when they’re turning out models this nice it would be churlish to complain. These took some getting used to (particularly the names which have to be the daftest of the bunch) but the more time I spent looking at them the more I decided I actually quite like them. The beards on the boars have already been complained about in suitably hyperbolic terms pretty much everywhere so I’ll spare you a rehash. Suffice to say the bold may wish to cut away the beards, or at least give them a trim, at which point the fact that the front legs of the pig are separate will undoubtedly come in handy. A lot of people have, by way of criticism, compared these models to the beastmen Razorgors (allegedly the ugliest model in Games Workshop’s catalogue). However I tended to see this from the opposite angle – that here is a model which, with a little judicious converting and mutating, could be turned into an excellent Razorgor. As an aside I’m actually a little surprised that this model has survived the current cull sweeping through GW’s less popular items, suffering as it does from the perfect storms of being an almost universally disliked model in an unpopular medium (finecast) and part of an under-supported range (beastmen). Sadly the biggest mistake with these models has been moulding the Orc rider directly onto the steed, something which makes both pig and rider next to useless to convertors without considerable effort. I’m sure they had their reasons but to my mind this cripples the usefulness of these models apart from for spares. At least we can raid them for heads – and here at least a little of the variety that is missing from the Brutes has snuck back in. To be honest I’m really sure what to make of this one. At first glance he looks like some boozed-up frat-boy from an American teen movie, something not helped by the fact that he appears to be wearing shorts. I can almost hear the chants of ‘chug, chug, chug!’ as he holds those cups aloft. His background fiction also seems a bit hastily assembled. Essentially he likes drumming on things (so presumably those are not drinking cups at all but bones for hitting things with… for some reason). In many ways this reminds me of the ‘crazy blacksmiths of Khorne’; the Skullgrinder, and suggests a lack of joined-up thinking when it comes to the design of the game. Rather than creating a concept which fits the world then designing rules and a model to evoke it, it seems that some of the Age of Sigmar creatures are being sculpted first and shoehorned into the world later. Once again though his face is delightfully bonkers and would lend itself well to any Ork character. Not worth getting the whole model for though. Overall then, I rather like this release. It won’t have me rushing out to buy but then I’m not the target audience. Fans of Orks should find plenty to steal from this release, whilst those who’s Orcs are still raiding the Old World should be able to get more out of this than dwarf players did from the Fyreslayers. There are a couple of things that strike me about this release however. The first is that, of all the things GW’s fantasy greenskins have been missing none of these – with the exception of the Wyvern – were particularly high on the list. I know this is essentially an Orc release, rather than Goblins, and that this is aimed at shaping the greenskins in Age of Sigmar rather than filling gaps in the Warhammer line. Nonetheless with squigs, goblins, wolf-riders, snotlings, pump-wagons and both chariots looking distinctly elderly it’s hard not to feel that an opportunity has been missed there. Secondly the alliance of Orcs and Ogres that began back in the End Times seems now to be very much ‘a thing’. With this being the case it might be nice to see some models that actually draw the very different aesthetics of the two races together in some way, rather than just pretending that, in spite of the untold millennia that have supposedly passed since the death of the Old World, the two races have stubbornly kept to their old appearances. With these bigger, meaner Orcs we had an opportunity to mix the two a little, creating a series of models which would help bond the fat men back into the ranks of their greener comrades. The only time this really happens is with the rider of the Maw-krusha. Otherwise the Ogres share much more in common aesthetically with the Fyreslayers (both fire-worshipping mercenaries with a love of stylish facial hair and an aversion to getting fully dressed). Do you agree with my rambling, or are you readying a rusty choppa and heading down to the design studio to ‘av words’? Do you have a great idea for a conversion based off these kits? As ever the comments box is the place for you! Edit: Inspired by this post the talented Iriselsewhere drew Orruks performing Hamlet. Now we just need to inspire someone mad enough to make a diorama of this!